With these Tech Corp speakers you can listen to crystal clear audio almost anywhere, even in the shower or outdoors in the rain! The speakers can stream audio from any Bluetooth enabled device and you can even use the speakers as a hands free system for your mobile phone, which means you can take your calls in the shower no problem! When using the speakers with your mobile music is interrupted with a ring upon receiving an incoming phone call, then when the call is ended the audio will resume playing where it left off automatically. This Tech Cop device offers a full control panel with Play/Pause, Next/Back and Receive phone call buttons, plus a suction cup which seams to stick to just about any smooth surface. However it should be noted that this Speaker is designed for use in wet locations, but is not designed to be immersed in water! The sound from the speakers is great and you get around 6 hours of playback time from a single charge (the unit takes around 3 hours to charge up). This unique tire shaped system is compatible with iPhone, Android and Windows mobile phones and tablet devices, and suitable for most outdoor activities such as camping, fishing, kayaking and hiking. The speaker is easy hang on backpacks or belts via a carabiner using the convenient handle and light-weight and compact. despite the compact size, this speaker system is easily capable of filling a room with crystal clear sound and decent bass performance. Connecting flawlessly to all Bluetooth enabled music players, but also with a wired AUX input for use with older audio equipment. Weighing only 170g and smaller than a baseball, the speaker is easy to carry even on long hikes or trips, yet can provide plenty of entertainment. The IPX4 waterproof body is designed to withstand water splash and occasional drink spill (though not immersion) and the standard Aukey 18 Month worry-free warranty gives peace of mind! This shower speaker also features an FM Radio, and has a useful LCD Display plus is capable of a whopping 10 hours of wireless playing time. The unit provides a clear and crisp sound and can be used in bathrooms, by the pool or on the beach – in fact pretty much anywhere you want to enjoy music! 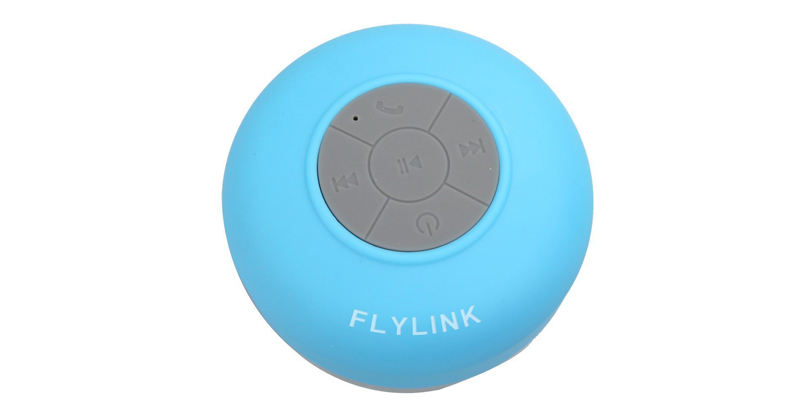 The strong removable suction-cup means you can stick this speaker securely to smooth surfaces such as walls, glass, counter-tops, shower tiles or even baths. The lithium ion rechargeable battery offers class leading playback time with up to 1500 hours of standby and the latest Bluetooth 4.0 technology means optimised and fast Bluetooth pairing. The built-in microphone has digital noise cancellation for clear phone calls and you can now answer calls even while taking shower. The Bluetooth range is up to 30 feet with no obstructions and the unit itself measures just 85 X 85 X 54mm so is easily portable. The product also comes with a 45 days money-back and 12-month hassle free warranty.